VIDEO Clipper - Share the Live Music! Let us broadcast live music! VIDEO Clipper offers live music experiences in the world .You can start the live delivery anytime . Look at the live music in the world! 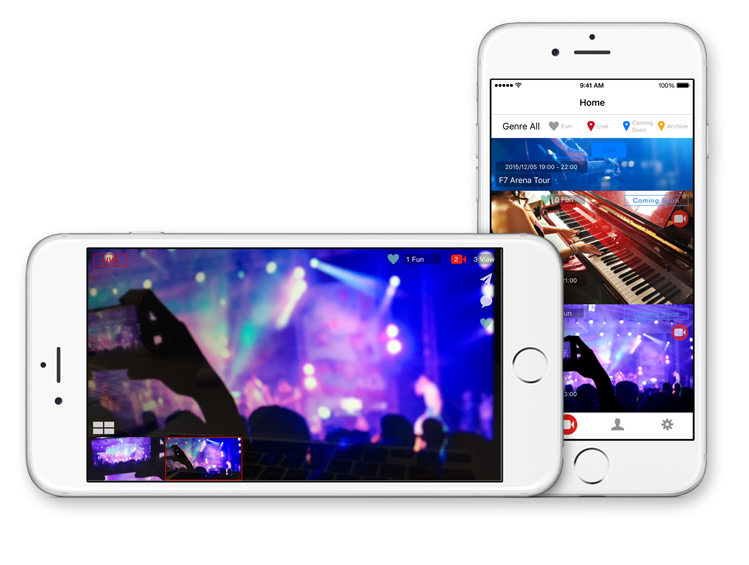 VIDEO Clipper is a video streaming service to broadcast videos of live music performances in real time with multi camera angles, and viewers can enjoy them anywhere in the world.It broadcasts live stream videos with multi camera angles taken by this app from anywhere in the event area. - Basic features are provided for free. - Taking and Broadcasting a video with HD quality (1280×720) is a paid service. You can enjoy multi camera angled broadcasting live show videos in real time with a function to select camera angles. The archived videos will also be enjoyable with multi camera angles. You can start broadcasting and distributing videos anytime with simple operations. Please broadcast live performances held in your room, your school, clubs, streets and more for instance. If you want to be one of the camera crews for a live show, you can join as a crew. Please take and broadcast a video from your favorite angle. Surely some people will become fans of your video. It supports logins by Facebook, Twitter accounts. Please share your favorite coming up live shows to your friends. Many artists want to reach as many fans as possible. If you find great live show videos, just bookmark them by clicking Fun to add your favorite. You will be able to easily access and enjoy the bookmarked events in the Fun list. You will be able to broadcast videos in HD quality (paid service). If you are a high resolution mania, please use this service. You can post comments on broadcasting videos. Please warm up the broadcasts with all camera crews and viewers by posting comments. If you link your social media accounts, your comments are fed to them. It implements 360° VR videos functions in version 1.3. You can broadcast and view 360° VR videos with multi camera angles. Please enjoy a you-are-there feeling more.>>Broadcast VR Videos. If you want to distribute your videos to the limited users, you can create and broadcast private events. Users will be able to start viewing them after password authentication. Faith, Inc. All Rights Reserved.